This is the script that I use when I need to add several new port groups to a single VMware cluster. The script does check for the port group before it tries to add it to the VMhost encase it was already setup. Below is the format for the NetworkInfo.csv. 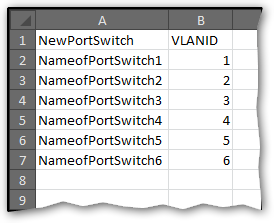 You can add as many port groups as you need in to this file and it gets feed into the script. Thanks for the update to the script. We have a plan to get the work environment up to 6.7u1, but it might still be some time before we get it completed. The upgrade isn’t too bad. If you use the VCSA it makes it almost painless. I could walk you through it over the phone if you want to. I learned from a couple of mistakes that I wouldn’t want you to repeat. Nothing horrible, but I rebuilt a host that I could have just had the VCSA automagically update.